white floral attendants, unfurl from chilled earth. scatters volunteer bouquets over granular sand. 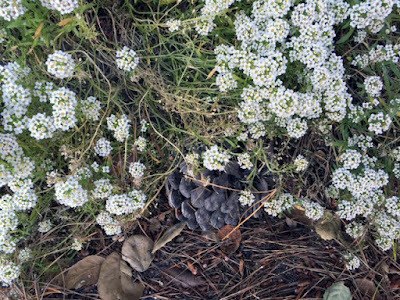 of blossoming alyssum's burgeoning musk. colonize bare beds of a possible poem. transforms granite words with flowery scent. Jennifer Lagier is an aging hippie who has failed her way through multiple careers. She now consorts with others who share her addiction to the arts and a fascination with snakes.